In developing their vacuums and vacuum bags, Simplicity begins with the emphasis that vacuum cleaners are carpet and floor cleaners, first and foremost. Certain filtration technologies impede airflow and can jeopardize the vacuum’s cleaning performance, and Simplicity believes that goes against the very purpose of the vacuum cleaner. With this in mind, Simplicity sought out filtration solutions that provide high filtration while maintaining high airflow performance. Simplicity calls this AST - Allergen Suppression Technology. Now Simplicity offers filter bags in two main categories: HEPA and Healthy Home with AST. Simplicity Healthy Home with AST vacuum bags provide high levels of filtration, up to 6 times better than a standard vacuum bag. The electro-static micro-liner of these bags traps particles as small as 0.1 micron, efficiently removing dust mites, mold spores, pollen and other allergens from the environment. Healthy Home vacuum bags are treated with BioClear, which inhibits the growth of bacteria, germs, mildew and mold on the bag and helps reduce odors. 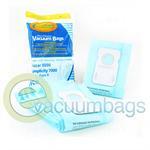 Simplicity Type B vacuum bags for Simplicity 7 series and 7000 series vacuum cleaners. Simplicity Type F vacuum bags for all Simplicity Freedom vacuum cleaners, including F3700, F3600, F3500, F3400, F3300, and SF1. Simplicity Type G vacuum bags for Simplicity compact canister vacuum cleaner models Scout and S11L. Simplicity Type H vacuum bags for Simplicity mid-size canister vacuum cleaners S13L, S14CL, S18, S24, S38. Gusto and Moxie. Simplicity Type J vacuum bags for Simplicity mid-size compact vacuum cleaners Champ and S12. 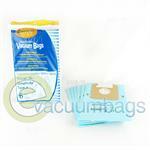 Simplicity Type Q vacuum bags for Simplicity MSV QuickSilver vacuum cleaner. Simplicity Type S vacuum bags for Simplicity portable vacuum cleaners: Sport and S100. Simplicity Type Z vacuum bags for Simplicity Jack, Jill and Snap canister vacuum cleaners. Simplicity Genuine HiFlow HEPA bags are constructed from a high quality white synthetic cloth. These ultra thick HiFlow bags provide superior filtration for airborne allergens such as mold spores, pet dander, dust mites, and pollen. 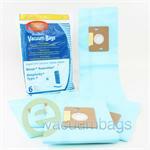 Simplicity Type B vacuum bags for Simplicity 7 series (7700, 7750, 7850, etc.) and 7000 series (7200, 7250, 7300, 7350, etc.) vacuum cleaners as well as commercial models (7400, 7450, 7900, 7950). Simplicity Central SCB-3 for Simplicity Central vacuum models: SPU-B2, SPU-B4, SPU-B6, SPU-B10. Simplicity Type F vacuum bags for all Simplicity Freedom vacuum cleaners, including F3700SAND, F3700, F3600, F3500, F3400, F3300, and SF1. Simplicity Type H vacuum bags for Simplicity mid-size canister vacuum cleaners S13L, S14CL, S18, S20, S24, S30, S36, S38, Verve, Cinch, Jessie, Gusto and Moxie. Simplicity Type W vacuum bags for Simplicity Synchrony upright vacuum cleaners including models SCRP, SCRD, SCRS and SCRC. Simplicity Type X vacuum bags for Simplicity Synergy X-9 and Synergy G9 upright vacuums. Generic EnviroCare Micro Filtration Paper Vacuum Bags for Riccar 8000 / Simplicity 7000 Vacuum Cleaners using Type B Bags. 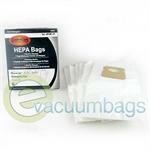 EnviroCare HEPA Paper Vacuum Bags for Riccar 8000 and 8900 Series Model Vacuums. Generic Type F Micro Filtration Paper Vacuum Bags for Riccar Supralite and Simplicity Freedom Model Vacuums. 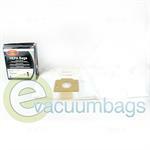 EnviroCare HEPA Paper Vacuum Bags for Simplicity 5000 and 6000 Model Vacuum Cleaners. 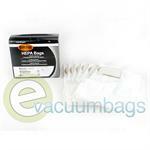 EnviroCare HEPA Paper Vacuum Bags for Simplicity Freedom Upright Model Vacuums. 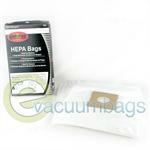 HEPA Paper Vacuum Bags, by EnviroCare, for Simplicity Vacuum Cleaners. This package contains three replacement vacuum bags and both pre- and post-filters that are genuine Bissell parts. This vacuum bag and filter combo set works in theSimplicity Scout, Bissell Butler Compact Canister, and the Butler Propartner series. 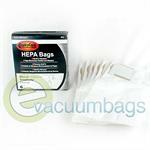 Generic EnviroCare HEPA Paper Vacuum Bags for Simplicity Synchrony Upright Vacuum Cleaners. Generic EnviroCare HEPA Vacuum Bags for Simplicity Synergy Model Vacuum Cleaners. 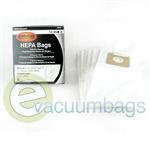 EnviroCare HEPA Paper Vacuum Bag for Simplicity Model Vacuums using Type B Bags. 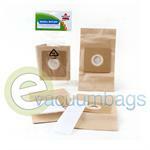 EnviroCare Micro Filtration Paper Vacuum Bags for Simplicity Vacuum Cleaners using Type H Bags. 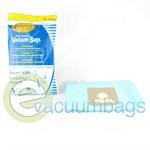 EnviroCare Generic Micro Filtration Vacuum Bags for Simplicity Champ Mini Canister Model Vacuums using Type J Bags.